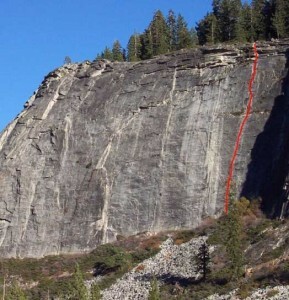 When most East Wall routes have four or more climbers a piece, there is often no line on Psychedelic Tree. Here’s why: 1) the route is sustained at 5.8 and 5.9 and 2) fewer ascents mean more dirt and loose blocks. Psychedelic Tree could be considered The Line’s ugly twin: it’s just as direct and just as striking but with more munge and loose blocks. It does, however, have a more dramatic finish than The Line. Don’t be surprised if after a few hundred more ascents, this route cleans up to be a four-star classic. Which SuperTopo guidebooks include a topo for Psychedelic Tree?